Make minor changes to your reports in JuanTax. Sometimes, it's inevitable to go back on a previously filed return and re-submit or amend, especially if the changes are material. The good thing is that you can make changes to your tax reports in JuanTax. In order to do that, you need to go to the details page of your report and click the Amend button on the top-right corner of the screen. 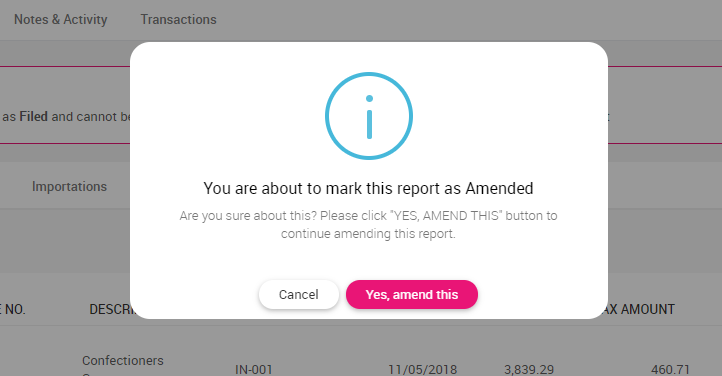 Confirm that you want to amend the report by clicking the Yes, amend this button. JuanTax will open a preview showing the Old Report (as filed) side-by-side with the newly Synced Report pulled from Xero. Review the changes and commit by clicking Update.